DENVER, Colorado, April 7, 2011 (ENS) – The Colorado Petroleum Association Monday gave up its attempt to roll back a 2008 Colorado regulation requiring companies to dispose of used waste pit liners in accordance with state solid waste laws. The Petroleum Association’s pit liner petition to repeal Colorado Oil and Gas Conservation Commission Rule 905 was withdrawn at the commission’s regular meeting Monday. The nonprofit public interest environmental law firm Earthjustice opposed the petition on behalf of the Colorado Environmental Coalition and other conservation and sportsmen’s groups. Pit liners are large sheets of synthetic, impermeable material used to keep fluids and other mining waste products from seeping into the ground during drilling operations. 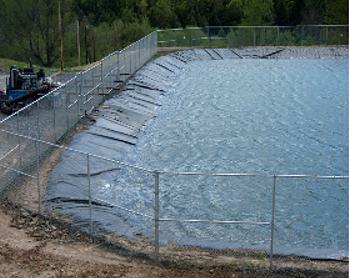 Used pit liners are typically coated with a variety of chemicals and hydrocarbons. Burying liners in the ground could lead to contamination of soil and groundwater. In response, Earthjustice requested an opinion letter from the U.S. Environmental Protection Agency on that issue. On September 15, 2010, EPA ruled that pit liners are not exempt as exploration and production, E&P, waste. In announcing the withdrawal of its petition, CPA indicated that it is working to develop an approach with the Colorado Department of Public Health and Environment to address its pit liners under current Colorado solid waste laws that govern landfill permitting and waste disposal. Earthjustice will continue to monitor that process to ensure that CPA identifies an environmentally sound solution. New and more environmentally-protective oil and gas regulations were put into place in Colorado in 2008. CPA’s petition, filed in March 2010, represented the first major attempt to roll back one of the rules.